Could you try it on the other M2 emulator games too and see if same issues occur? the result is absolutely fantastic with Outrun2 and ID8. Really glad you are enjoying it! Daytona usa, indy 500 -> wangan's road effect when turning even a little is no more! I had an old unwanted settings for my model2 emulator inside logitech profiler. My wheel was set on 200° . It is not enough. I set it to 270° it' s perfect now! Over rev -> no effect or very very weak effect ( i have set the game as you recommand in test menu ). I need to try again with this game. Sega rally -> ffb is working. I also tried wave runner gp, -> i didn'nt notice any ffb effect for this game. And especially since i reconnected my real initial D sequential shifter !!! , these games are absolutely excellent!!! I would like to feel less effect when i drive on the vibrators with ID6,ID7,ID8.... but didn'nt figured out how to set up. I played with feedbacklenght and max/min forcefeedback value but, i never figured out the correct setting. For me, the wheel is perfect with your default setting ( hardness when i turn) but the effect ( shake ) when i drive on certain surface is to much and my steering wheel shakes loudly at each end of the race... this is this effect i would like to delete. a wish list if you don't know what to do in the day to come! do you think it's possible one day to have ffb for these games? Demul has no ffb effect... it's sad because demul embarks naomi games, and the well known ID1 (initdexp), ID2 (initdv2e) and ID3 (initdv3e) [export version]. it would be awesome to have ffb effect for these games too. I didn't know about nascar! For now i need to improve my homemade steering wheel support, so i will let you quiet for a while i think. But, what kind of steering wheel do you use? on my side, I made myself a rotating support for my steering wheel but even if i improved it a bit today, it is not perfect at the moment. Anyone help me out with proper Daytona championship ffb .exe? Thanks ! salut, apres beaucoup de test, j'ai enfin compris comment gerer les effect dans initial D (ID8 pour mes test). alors, en gros, si tu baisse le FFB depuis le profiler, ca diminuera la force des "tremblement" du volant dans les virage ou en cas de choc. Mais PAS sur l’effet de force du volant dans les virages ! autre chose, si vous changer la force dans les Option du jeu, ca n'influe que sur la force du volant, et pas sur les tremblement du volant. Ok, merci pour tes tests. En gros, je dois juste baisser encore un peu le ffb dans le profiler pour Id6/7/8. Edit: est ce que ton volant tremble a la fin de chaque course dans les ID? Oui il tremblotte a la fin de chaques course, mais j'avais trouver un bon equilibre a un moment, et avec ce reglagee il ne tremblai plus en fin de course. mais evidement, ca ne m'a pas suffit, et j'ai refais d'autre reglages. 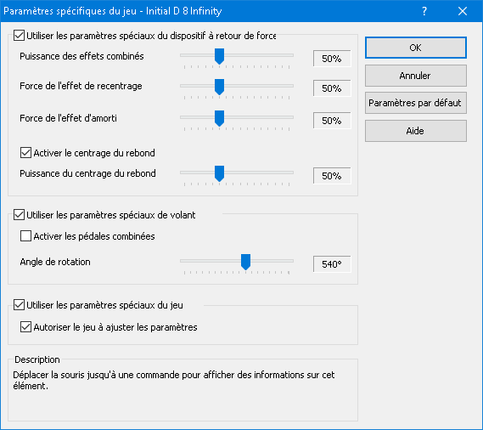 c'est pour ca qu'il faut vraiment tatillonner entre les 2.
moipour les ID j'aime on sent un peu de resistance, mais pas de trop histoire de pouvoir passer les 540° du volant d'une mains quand on passe d'un extreme a l'autre, et j'ai remarqué que c'est plutot ce tremblement qui a tendence a alourdir le volant alors que la voiture ai sensé décrocher, avec donc le volant dans le vide. Ok. Bon courage car j'y ai passé du temps et mes derniers essais n'étaient pas concluant a cause du tremblement du volant en fin de course dans les InitD uniquement. Pour tous les autres jeux, j'ai trouvé un réglage qui me convient. Thanks, Logitech FFB Pro acting all weird with Sonic All Star Racing, looks like its going into a left right calibration loop but jittery and does not stop until I escape TeknoParrot. No issues with Mario Kart. Any settings in the ffb .ini to change? Update: In race if i grab hold of the wheel it settles and ffb works, moment race is over it starts again with wheel turning left-right making selecting bit difficult. If I turn on alternative ffb in ini, the wheel turns all the way to the right with force. Thanks I will play around with those settings to see if the oscillation tones down. G25 wheel. Copy the files to the daytona folder. Start up the game , it detects the ffb. But turns up side down. Don't know what i do wrong pffff. Yesterday wheel was turning half way. I messed up al my settings with the , so i installed everything from scratch. Now wheel turns up side down. Also don't seem to work other then from the c drive. Don't work if the game is installed on the d drive. 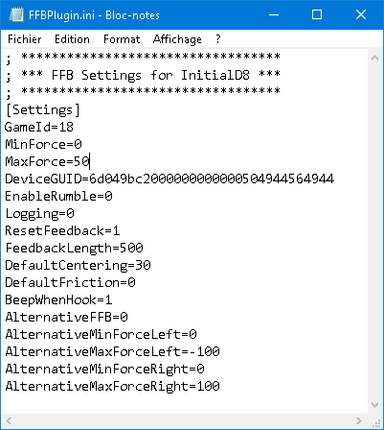 Yes 100 % sure ffb is disabled in x360ce. Like i said the ffb seems to work. I start the game , you hear the wheel already having ffb. The game starts . I push start and my wheel turn up side down by itself. Don't know hox it comes. When i delete the 4 files for the ffb . The game runs fine but without ffb then offcourse. Do you have have logitech software in taskbar ? Yes , you mean the logitech profiler . 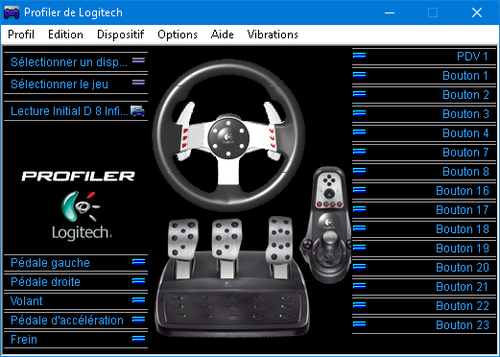 this is my logitech setting (g29) for daytona usa. oh but wait one time , do you use the daytona.exe , Me i use the daytona launcher.exe .